The B-17G-60-VE Flying Fortress is a Rank IV American bomber with a battle rating of 6.0 (AB/RB) and 6.7 (SB). It was in the game since the start of the Open Beta Test prior to Update 1.29. 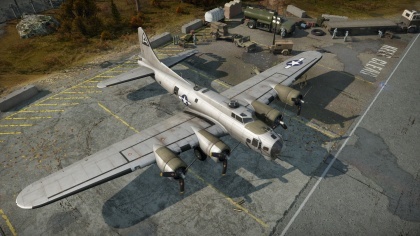 The B-17G Flying Fortress, as the name suggests, is intended to be used as a high-altitude level bomber, designed to target enemy airfields and military bases. Despite its large bomb-load, it is not recommended to target moving ground targets such as tank formations. This due to the inaccuracy of bombs being released at high altitude. When using the B-17G, it is always best to group up with others in a wedge-like formation for optimal defense. The higher you climb the harder of a target you will become. A few fighter escorts, such as a squadron of P-51 Mustangs would ensure the survival of friendly bombers. Survival is an utmost importance to be remembered when using this plane. While you may miss one target, you can always make another pass once you reload and repair. ? ? 11,156 ??.? ??.? ?.? ?.? ? When facing fighters and interceptors in Realistic Battles, it is best to use Omni-purpose or Armour-piercing/Ground Target ammunition belts for the 12.7 mm M2 Browning machine guns. These ammunition belts are effective at tearing through the engine block and hopefully resulting in an internal engine fire. You maybe also able to score a pilot kill on your opponent. B-17s are notoriously hard to kill when compared to similar Soviet and German bombers. However, with the B-17 the best defense is to evade your opponent altogether. Your worst enemies will be almost all fighters due to the high BR (FW-190 D, Ta-152, BF-109 G-10/K-4, F8F-1B, Tempest, etc.). Most fighters will have 2-4 cannons which can still make short work of the B-17. NOTE: The weakest area of approach with the B-17G is the front. Only 1-2 MGs can be focused directly forward if a fighter head-ons you. The crew is also focused at the nose. If there is a fighter at your level , try to turn and expose the tail "barb". Diving may work as well. However, diving can put you into more danger as more fighters may swarm you. 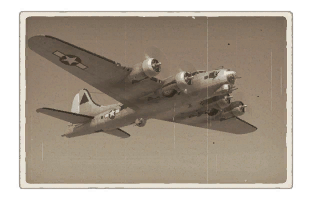 When climbing to fight the B-17, you will most likely have a lower energy level depending on the plane you use. The F8F-1B, for example, has an extremely good acceleration with WEP and can climb ridiculously quickly as well. If in a plane such as an F8F-1B, attempt to head on the B-17 as this is the weakest point. If the B-17 turns away, climb and chase the Flying Fortress at a higher altitude and then dive on it from an angle. Always avoid tailing a B-17, regardless of model. This just warrants a knocked-out pilot or fire. This slow and lumbering heavy bomber relies entirely on its turrets for defense. Without it the plane is target practice. Thus "Protective vests" should be the first unlock. Further survivability upgrades will make the fight easier, but do not think it will successfully face-off against enemy fighters. So upgrading the bomb payloads should be second priority. Performance modules can be considered least necessary. Due to direct experience from U.S. Bomber crews in 1943, the B-17F revealed inadequate protection from head on attacks by enemy fighters. The primary change introduced with the B-17G was the remote controlled chin turret armed with two 12.7 mm M2 Browning machine guns. This new addition proved to be more practical than manual operated guns initially fitted to the nose. The B-17G began delivery in September of 1943 and included various upgrades throughout its production. A total of 8,680 aircraft were built from three manufacturers until April of 1945. The B-17G could be considered the corner stone of U.S. bombing efforts in the European theater between 1944 and 1945. This page was last edited on 11 March 2019, at 06:53.